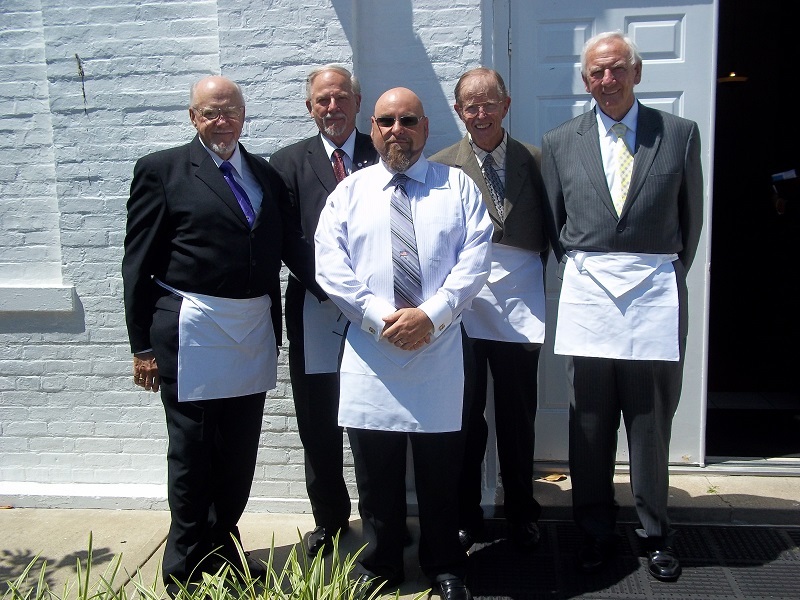 Brothers of Elvin E. Helms Lodge No. 926 observed St. John the Baptist Day and were welcomed at Petersburg Christian Church. Following the service a dinner was served for those attending. Pictured, left to right: Garry Kelly, Ed Tanner, Travis Bush, Ernie Stratton, and Mel Kinser, Past Masters all. Above is the card that Christopher Sanders sent to Elvin E. Helms No. 926 thanking us for the hospitality shown to him and his family during their visit. I think I can speak for everyone when I say that we truly enjoyed having the Sanders Family in our Lodge and loved Christopher’s presentation of his first prize winning essay. He will be sharing his prize package with administration at Conner High School in hopes of encouraging others to enter the Barney Hogan Essay Contest in the future. Pictured above is Christopher Sanders, a junior at Conner High School in Hebron, Kentucky, and the first place winner of the 2015 Bernard A. 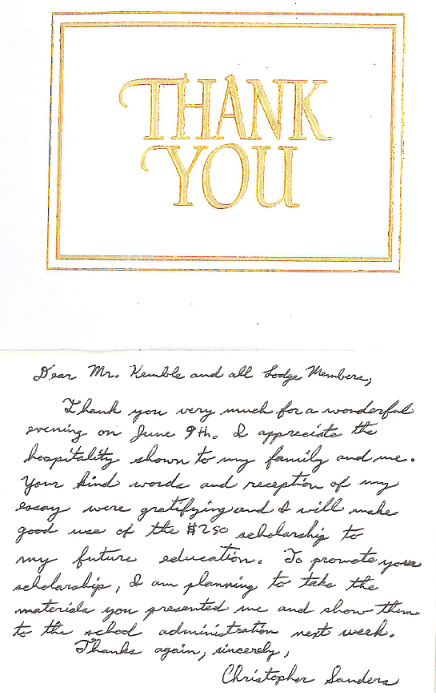 “Barney” Hogan Essay Contest sponsored by Elvin E. Helms Lodge No. 926 in Petersburg, Kentucky. Mr. Sanders wrote his winning essay on the topic of “Freemasonry and the Culture of America.” Christopher is the son of Mr. And Mrs. William L. Sanders III. 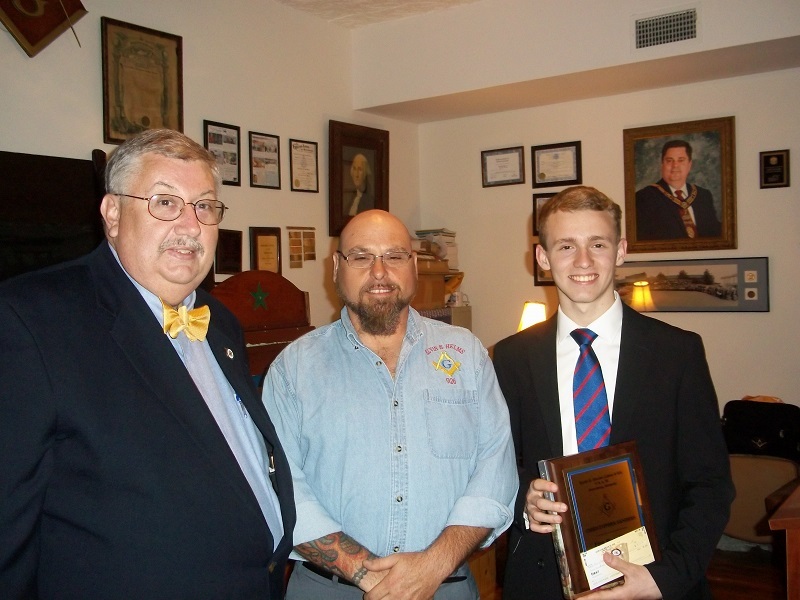 In additional to his cash prize, Christopher also received a plaque from the Lodge and a copy of Mark Tabbert’s book, American Freemasons: Three Centuries of Building Communities. Shown above with Christopher are Dan Kemble, Contest Committee Chairman, and Travis Bush, Master of Elvin E. Helms Lodge No. 926.